We are called to love one another and treat one another with compassion, understanding, and respect. We strive to create an environment that is physically and emotionally safe where youth feel comfortable asking questions and seeking guidance and support. We seek to live as a community of faith in which everyone feels welcome. We live with contagious excitement about our faith that draws others to become a part of our church family. We explore the many gifts God has given us and we share them with one another. We worship and serve God as part of a larger Christian community both as Presbyterians and as followers of Jesus Christ. James oversees the youth ministry of the church including Sunday Night Youth Fellowship, Confirmation, retreats, conferences, and mission trips. He regularly assists in worship leadership on Sunday mornings, leads Kindergarten Chapel, and often serves as the Dinner Dean for Kirk Club. He participates on both the Christian Education and Evangelism Committees and works with the Youth Leadership Team as they plan and lead youth ministry activities. Originally from Lexington, South Carolina, James completed his undergraduate studies and deepened his spirituality at Clemson University. 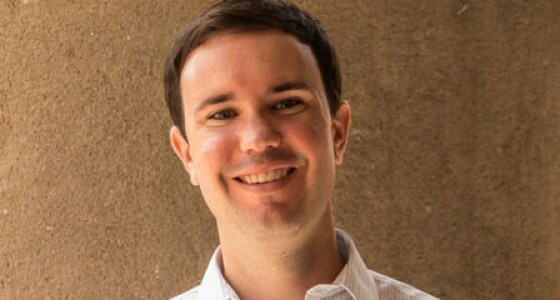 After receiving his Bachelor of Science degree in Civil Engineering in 2003, James felt God’s call to ministry and enrolled at Columbia Theological Seminary in Decatur, Georgia. In 2006 he graduated with a Master of Divinity degree and was ordained and installed as Associate Pastor at First (Scots) Presbyterian, where he loves seeing the youth of the church living out their faith in Jesus Christ. In 2017, he earned a Doctor of Ministry from Pittsburgh Theological Seminary. In his free time James enjoys spending time with his wife, Kate, and their son, Barnes. If they aren't watching House Hunters on television or taking a walk, you might find James playing golf at the Muni or rocking out on the guitar. Megan is the Middle School Youth Director and enjoys spending lots of time with the middle school youth. She grew up in Hartsville, South Carolina but moved to Charleston to attend the College of Charleston in 2003 and couldn't bear to part with this great city after graduation. She has a sweet and funny two year old son named Liam. She loves to travel and enjoy the outdoors, but her favorite thing to do is spend time with her family. Saye has been a member of First Scots for 9 years and is rejoining the youth ministry team after being the youth director at another church. He is excited about the opportunity to work at his home church again and to work with such a great team. He feels a call to ministry, especially with young people. His passion is in helping and encouraging others and working with local non-profits. He is a trained Stephen Minister and wants to complete his MSW and to look at seminary soon. He says trusting God has taken him far in life and hopes to share that faith through love and ministering with others. In his free time, he loves live music, running the Cooper River bridge, finding a good deal, and spending time with his girlfriend, JC. Carrie Simpson grew up in Summerville, graduated from Presbyterian College, and currently teaches pre-k in Dorchester District Two Schools. She is excited to be a part of youth ministry here and looks forward to each opportunity to play, pray, and serve with the fabulous youth of First (Scots)! Carrie enjoys spending time with family and friends and never misses an opportunity to be outdoors. She loves running, biking, and exploring the mountains of North Carolina. Twizzlers, peanut butter and avocados are her favorites, just not all at the same time! She hopes to one day visit Serengeti National Park in Africa. Cameron Widman Leyh grew up just around the corner from First (Scots) and has been attending all her life (even for Kindergarten!). She attended Wofford College in Spartanburg and spent some time in New Zealand before returning to Charleston. She is currently a property manager for a condominium project downtown. In her free time, Cameron loves to be out on the water. Cameron loves working with the youth, as she has fond memories of her time as a youth at First (Scots). 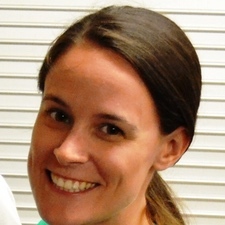 Hayley Carter has been a member of First (Scots) since 2006. 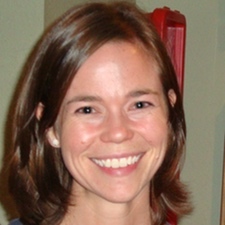 She is married to Jon Carter and has three children: Jackson, Ethan and Piper. Some of Hayley's favorite activities with the church include working on the Christian education and nominating committees as an elder, leading Kirk Club as the Co-Director, and teaching both children's and adult's Sunday school classes. She is really looking forward to getting to know the youth better by serving as a middle school advisor. In her spare time, Hayley loves to travel and had an amazing experience this summer cruising to Alaska with her family. She also likes to exercise and walk four miles every day. Hayley used to work as a physician in the emergency department, but now she think she might try something new. Who knows??? Janet White grew up near Seattle, Washington. She graduated from Washington State University, GO COUGS! (and the University of Washington School of Medicine.) She practices pediatrics in Mt. Pleasant, where she lives with her husband John Sr. and kids (John Jr., William, and Susan). Janet is happy to live in South Carolina where the sun shines more than it rains! She has been a member of First (Scots) since the 90’s. She was a youth advisor before she got married, and is thrilled to be back now that her kids are all active in the Youth Program. Her favorite part of youth ministry is the retreats. Janet enjoys walking, shopping, visiting family in Washington State, and hanging out with friends. Jessica Hudson’s childhood was exciting, as she grew up with both parents in the Air Force, which meant moving all over the US. After the Air Force her parents settled down in Maryville, Tennessee. While in Maryville, she was a member of First Presbyterian. Jessica transferred her membership to First (Scots) in March 2013, only a couple months after moving to Charleston. When she isn't working as an accountant, Jessica enjoys spending time traveling with her Catahoula, Merlot. They both love traveling back to Tennessee to visit friends and family. She is very excited to see how her relationship with Christ continues to grow in her third year of being a middle school youth advisor! How much does a polar bear weigh? Enough to break the ice! Hi, my name is Rachel Remsburg and I have been a member at First (Scots) for about five years. I am a deacon, usher captain, bell ringer, lay reader, and beadle. I am a senior at the College of Charleston this year, which I am very excited about! I am a biology major with a coaching minor. My interest is in forensics and coaching basketball. I am the second oldest of four kids to two wonderful parents who live in Concord, NC. I have an incredibly smart and beautiful niece who is almost three years old. I am an avid reader, writer, and Harry Potter nerd! I enjoy cheesy jokes, sports, music, and long road trips with good friends and family. I am looking forward to getting to know all of you in the adventures of this upcoming year! 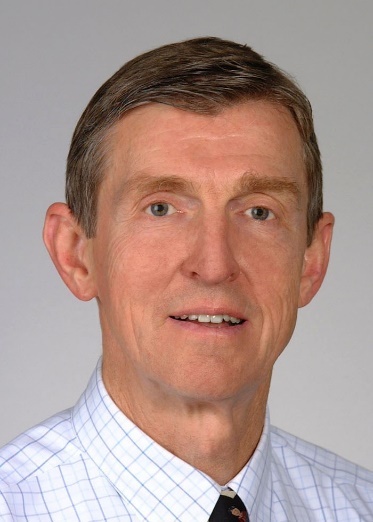 Rick Reed is a retired Pediatric Orthopaedic Surgeon starting a new career as a Certified Senior Advisor. His career for 45 years involved caring for kid’s fractures and deformities. He used Sports Medicine to pursue a passion for exercise, wellness and injury prevention. He is married to Grace Reed and has watched daughter Lee go through the process of maturity in a much different fashion than 2 older children now living in VA and CA. This educational process and being a past chair of Christian Education and teacher at every age level were merely steps in a continuing Christian Education commitment that will now attempt to incorporate older adult perspectives so that our denomination continues as the only institution that does not separate age groups into silos of independence. Working with seniors to enable them to age in place entails integrating their lives into a shared life continuum. It is hoped that intergenerational communities that were once centered around the Church can be revived. This will only happen when each age group is allowed to interact with each other during their Faith Journeys. Worship is at 8:45 a.m. and 11:15 a.m. in the Sanctuary (53 Meeting Street). Kirk Café is open from 9:30-10:00 a.m. in the Kirk House (62 King Street). Sunday School is from 10:00-11:00 a.m. in the Kirk House (62 King Street). 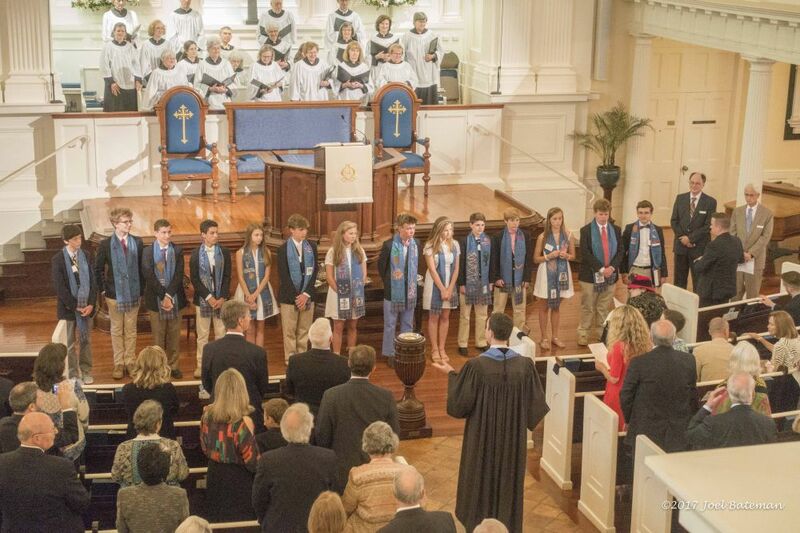 Confirmation at First (Scots) typically occurs during the youth’s eighth grade year. Older youth who have not joined the church as adults are encouraged to participate as well. This program teaches the essentials of the faith and prepares each Confirmand to publicly profess faith in Jesus Christ and become an adult member of the church. This class is conducted by Dr. James Rogers and adult Confirmation Guides during the Sunday School hour from September through April. Service projects and retreats are also a part of the program. Classes are based on the We Believe: Professing Our Faith curriculum by PC(USA), and the students have the opportunity to join the church on the first Sunday of May during the 11:15 a.m. worship service. From September until May the high school and middle school youth typically meet on Sunday nights from 5:00 p.m. - 7:00 p.m. in the Kirk House (62 King Street) for fellowship, service, congregational care, worship, and discussion/Bible study. During the summer youth events are typically during the week. For upcoming event dates and times, please check out the schedule. Youth Choir is from 4:30-5:15 p.m.